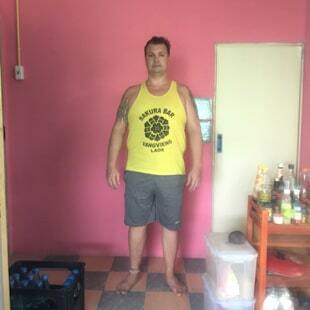 Against the odds: obese 40 y.o heavy smoker & beer drinker goes from Fat to Fit (cheats death) and transforms his body without ever stepping foot into a gym, or going on a diet. ere is the story of Ian. 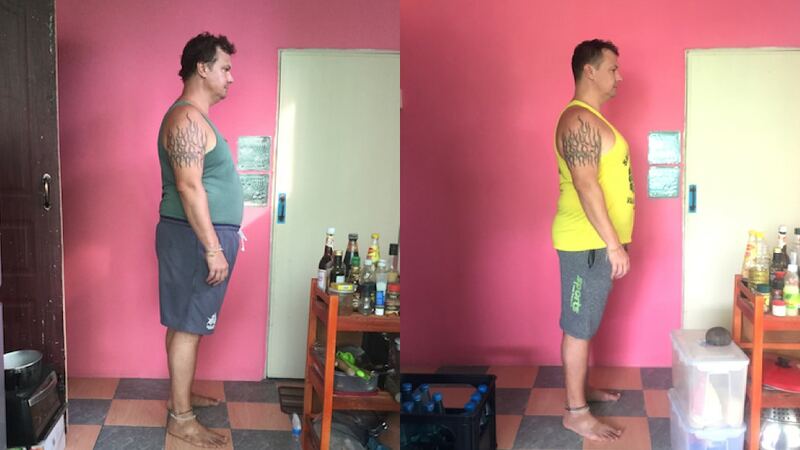 He has been our client for some time now and he has made astonishing progress not only in fitness but in his lifestyle in general. Ian has basically turned his entire life around. For example, quitting smoking after 25 years is probably one of the hardest things anyone can ever do! Ian started with Movement 20XX and Athlete 20XX programs but soon realized that accountability and commitment were his biggest downfalls. The best part about training programs is that they will keep you accountable but sometimes extra push is needed to really transform your life. As a result, Ian joined our personalized online coaching and has been kicking *** ever since. Nowadays Ian is pretty much doing a customized version of Movement 20XX and Athlete 20XX. Thanks to our progressive style, our training systems are suitable for all fitness levels, all body types, ages and genders. Without further ado, here is Ian's story in his own words. You can expect to get inspired and have a few laughs as well (this story is freaking awesome). Our plan is to document Ian's transformation story and progress from the beginning to the end - this is only the beginning! Ian: As you start reading the beginning of this article you will understand this is not your usual fat to fit body transformation story. 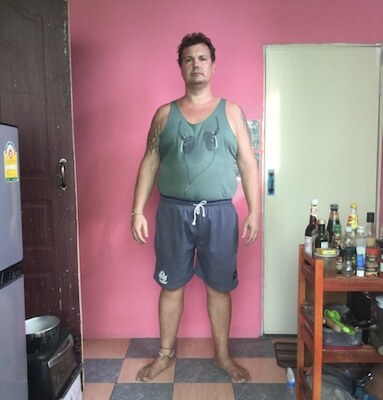 Not that you should care, but I’m 41 years old, I stand 180 cm (5'11'') tall and my weight when I started training with Athlete 20XX was 112 kg (246 lbs). That’s at almost 40 kg (88 lbs) of excess fat, and if I stayed at that weight, I was headed toward premature death. Let that sink in for a moment. Right now, as they are critical to our story let’s talk about cigarettes. As you’re aware tobacco is the devil disguised as a smoker’s guardian angel, always at hand to help. The trouble is the longer the smoking habit, the more willing you’re to believe the snouts are actually helping you. I allowed smoking to ‘help me’ for over 25 years. Smoking, much like drinking beer, or the formation of any habit (negative or positive) happens when you get a reward like feeling after performing a certain action, so you repeat that same action to keep getting the reward. My weight inducing alcohol and chips habit developed at night, after work, with me sitting in the garden at sunset and de-stress. The thought of exercising after work never entered my head, not when I could relax in the balmy evening sun and drink ice cold beer. In very short then, I had several unhealthy habits to deal with before I starting working out... and therein lies the biggest problem for inactive people. It’s much easier to think about working out than it is to begin your workout. And the crazy part is you don’t even have to think about your workout when you have Eero’s videos to watch. All you do is watch and repeat the movements Eero demonstrates in the Athlete 20XX videos. But there’s more… like most people, I have bills to pay and give many hours of my day to making money…. When am I going to have time to workout? "Excuses, excuses, excuses… I had some great excuses to make me feel better about skipping my workout." I wonder if you’re seeing the excuses that held me back from working out, as what they are… Excuses and nothing more. The point I want to make is this. When a person remains inactive the thought of putting stress upon their body is literally frightening. Let me explain. I’d become so heavy and lazy I’d put any excuse forward as a reason not to work out. It’s crazy I know. I wanted to shed weight and get ripped, but I had no connection with my body. To start a workout was to force my body to do something it did not want to do. Now you must understand sometimes at the beginning it’s a case of forcing yourself to work out and this attitude, and these first steps are vital to long-term success. In my case, forcing myself through those first few workouts started a chain reaction of healthy habits, each new positive habit building upon the last. Ian's progress since starting. Massively improved posture. More strength and mobility everywhere. Improved coordination and movement ability. Nice fat loss. I quit smoking. Yeah, I ended my 25-year smoking career. I knew deep down if I could get a handle on smoking my self-respect would increase. And the more self-respect a person has, the more they want to work out and then eat fresh, healthy foods. In my opinion, everyone has something in their life (like smoking) which, if they could conquer all the other stuff like getting fit would follow automatically. "If I don’t video my workout, that means I’ve not done my workout." Find a way to make it inevitable that you’ll complete your workout. For me, it was recording a video of my workout. No video = No workout. Sure, I could still miss a workout if I wanted, but I had to explain to Eero at the end of the week, why I missed the workout. The less I missed my workouts, the more my self-respect increased. He suggests I need to cut down my food consumption. WTF! I’m off the ciggies and working out, and now you’re going after my food. Reluctantly I agreed to start cutting down meal sizes. Now you must understand after working out for an hour I was more hungry than usual and wanted to eat. I like to eat, sorry I do. I like to plan and prepare meals, and I enjoy most foods like white meat, tuna, beef steak, ribs, fresh veggies, fruit, and ice cream. The problem is I ate too much and there was no way I was going on a diet. Even the word diet is upsetting. I had no interest in eating six times a day or separating egg whites from yolks, counting calories or eliminating carbs, so I’ll tell you what I did to decrease my food consumption in a moment. Are you beginning to see how much mental energy I used up thinking about making changes to my lifestyle? Looking back I reckon I wasted this mental energy as I did not have a clear fitness outcome. Really think about this as it’s vital to your success to picture a realistic body-shape outcome before you start training. So, I pictured how I wanted to shape and develop my body and stuck to working out four times a week, and as the intensity level of the athlete program increased the more I realized how far my fitness had come in such a short time. Now, I have found a connection with my body. I can listen to my muscles, and push them further than they want to go, and I can do this in a controlled manner. When I work out I’m conscious of working individual muscles, I can feel my progress in my body, I use numbers (sets & reps) as a guide only. I’m happy, healthy, slimming down, and looking to start a new hobby, surfing (well when I travel from Asia to LATAM). And, I’m only in the middle of my journey. There are no before and after images in this article. There are progress updates only. And I’m doing okay, I feel good, but I also know there is a long way to go. The rest of this year for me is about losing weight, this is why I agreed to record videos and write blog posts for Eero. I’ve created another ‘inevitable’ situation to help me lose weight. Now, I have to talk to Eero and his readers, and viewers about my weight loss efforts. I began to listen to my hunger, and eat what my body told me it needed. Sounds simple huh? Well for a long time I listened to my head telling me what I should eat, and the weight loss breakthrough only began when I ignored my mind telling me what it thinks I should eat and listened to stomach tell me the truth. In short, my appetite decreased naturally, and I’ll go into more detail on foods on weight loss in another blog post. I hope you took something from this blog post. My intention is to share my experience, to show that there is hard work involved especially if you’re getting started, but it can be done, no matter how far you think your health and fitness has backslid. If there’s enough interest shown in the comments section, I’ll update the blog post later in the year to show my progress. If you want to change your life by looking and feeling healthier, then check out Eero’s Athlete 20XX program, I highly recommend it. It’s a fantastic change Ian, I’m excited to hear more about your journey! Keep up the good work!